The stock market is on a tear with the Dow and S&P 500 closing at their highest level since Dec. 3 on Friday. Home prices are also at an all-time high. It’s indisputable that the U.S. economy is doing well, but not everyone is reaping the benefits. Before the 2008 financial crisis, the median net worth of a family in the U.S. was $119,000. But since the country’s economic recovery, those families have faced a significant decline in wealth: their net worth dropped to $78,000 by 2016. Torsten Slok, Deutsche Bank’s chief international economist, says investors have been ignoring this for too long. It’s “a very important dimension [for] investors…in terms of thinking about how does this matter for me and my portfolio,” says Slok. 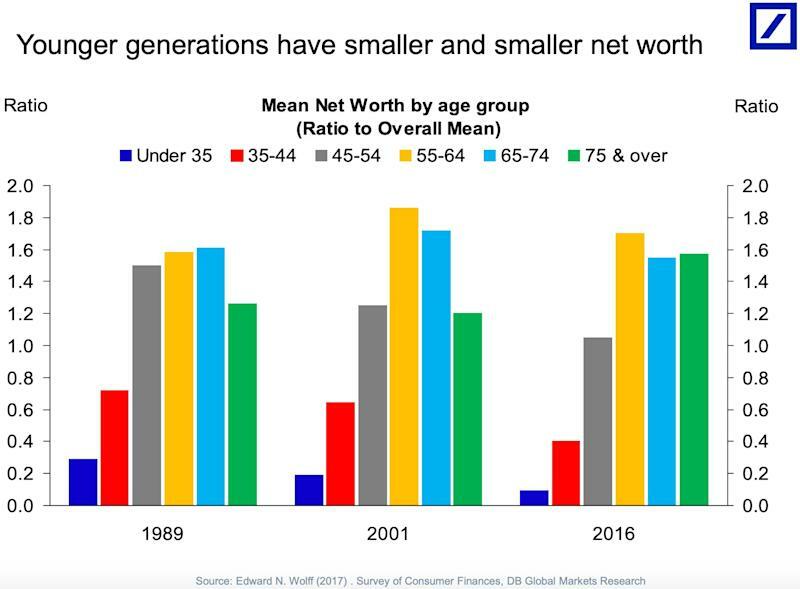 Economic inequality in the U.S. is fueled by the shrinking share of Americans who own stocks and falling homeownership rates, of 63% in 2016, its lowest level since 1965. 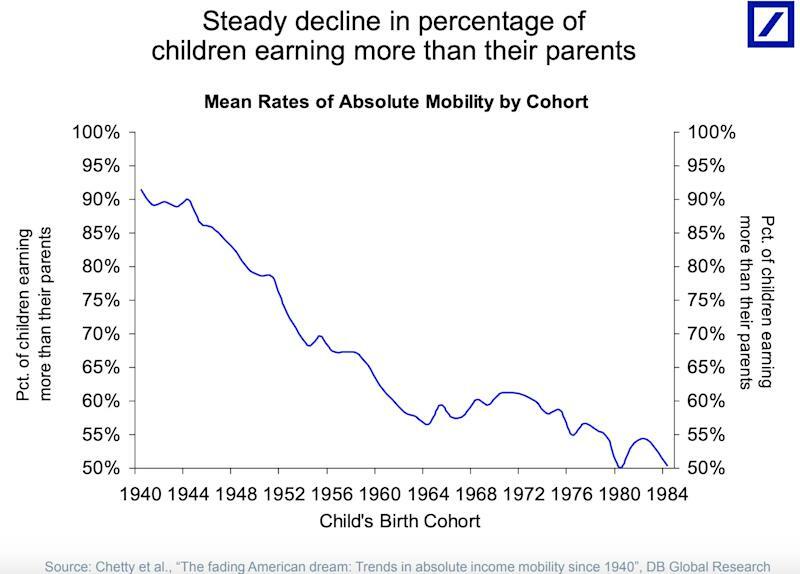 What’s more, the report shows the steep decline in the percentage of children earning more than their parents from 1940 to around 1984, when only 50% of children earned more than their parents. The numbers show younger generations are earning less than the same age cohort 30 years ago. “You may look at the front page of newspapers and read on the internet that the stock market is at the highest levels, and that might give you the impression that everything is great for everyone. But this chart is telling you no, everything is not great for everyone. 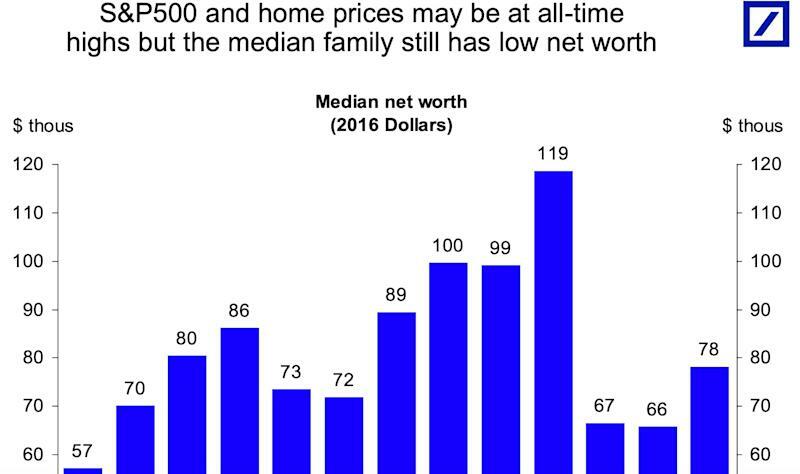 You can see that the median family is still seeing a significant decline in wealth despite stock prices and home prices being at record highs,” says Slok. The top 0.1% of U.S. households own as many assets as the bottom 90%, according to the report. Deutsche Bank attributes the country’s economic inequality to multiple factors: technological change, trade and financial globalization, labor market institutions, tax policies, and education.